VATICAN CITY—In a reversal of the Catholic Church’s longstanding doctrine, Pope Francis hastily condemned capital punishment Friday after Vatican police announced the discovery of significant new evidence related to a brutal 2014 stabbing death. “Capital punishment is an attack on the dignity of a person, and it is never acceptable regardless of the seriousness of their transgressions or how much incriminating proof is found,” said the supreme pontiff in a hurriedly assembled press conference hours after the Gendarmerie Corps of Vatican City State revealed they had uncovered new DNA evidence that would provide a breakthrough in the unsolved murder of a visiting cardinal in the Sistine Chapel. “Let us recognize that no Christian of good conscience should ever sentence someone to death, no matter what they did or how bad it looks or how carefully planned it appears. Capital punishment is an immoral practice, even if police have a rock-solid case after finding a knife used to stab a victim nearly 50 times taped beneath a church pew and covered in a single assailant’s fingerprints, as well as recovering a savagely dismembered body dumped into the Tiber River. 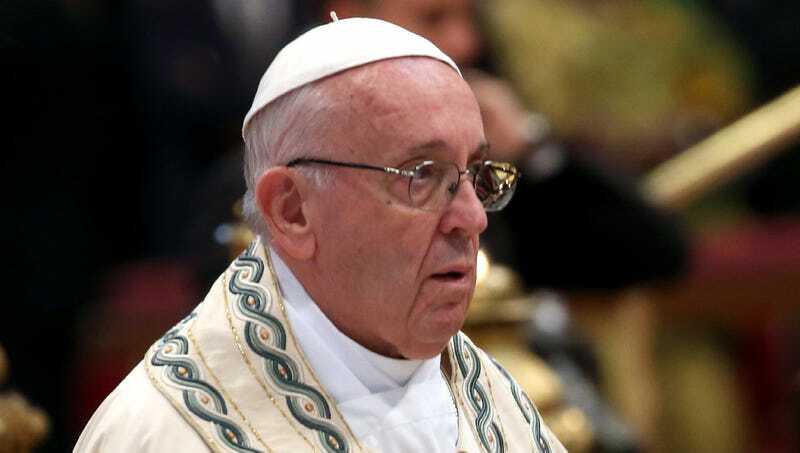 The death penalty is inhumane and must be abolished everywhere starting immediately.” At press time, Pope Francis had published a hastily written encyclical establishing it as new Catholic Church catechism that there should be no legal punishment for public urination.